Pro M vs. Yamaha? Well, I would probably choose the Yamaha, if the bearing edges are in good condition. I havea Yamaha Tour Custom (1987), birch. I'v eused this kit on a ton of recordings and it has never left me high and dry. Now I know you're considering the Stage Custom, and they are two different kits, but I like Yamaha. THat's pretty much it. The Pro M by Mapex is cool, in fact, Mapex offers pretty great deals. I worked at a local retail store (WLA Music) and got a good education about drums from the department manager, Frank Eck (really, the dude knows about drums). The Mapex kits always sounded surprisingly good (especially the Saturn kits) and we cost effective. The Pro M kits had great finished (wraps) and a nice vibe. The best way of knowing if you like a kit is to simply play it. If you have the opportunity to do so, hop on it! I've heard supposedly bad kits sound great, and great kits sound bad. Consider you application too. If you are recording, think about what will sound great on the discs you make (why I love my Yamaha's...birch records with fewer mid frequencies to manage from the engineer's standpoint). Go check both kits out, look at the bearing edges, and play them. Your heart will know which one you should take! I currently own Yamaha Stage Custom's and I've played several Mapex sets over the years, both intermediate and top of the line. 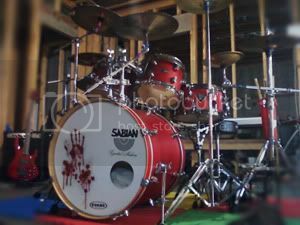 I've also owned top of the line Tama and Ludwig kits some years back. I can honestly say without any hesitation, that my Yammies sound as good, if not better, than the Mapex kits I've played and top of the line kits I previously owned. Of course, you always have to take into consideration head choices and tuning ability. And with a great top/bottom head combo...and proper tuning...I'm more than happy with my Stage Customs. That being said...don't you just hate hearing a top of the line kit sound crappy because the drummer doesn't know how to tune them?